SO, ACCORDING TO SOME RESEARCH, STEVE MCQUEEN SOLD HIS NICKLE PLATED COLT.45 REVOLVER TO MEL NOVAK (A FELLOW ACTOR, NOW TURNED STREET PREACHER) AFTER THEY MET TO SHOOT SOME CLAYS WITH JOHN MILIUS AND STEVEN SPIELBERG. THE MEETING WAS IN THE SAN FERNANDO VALLEY AND THE TRAP SHOOTING OUTING WAS TO TALK TO STEVE ABOUT A STARRING ROLE IN APOCALYPSE NOW. ABOVE IS THAT GUN THAT SOLD AT AUCTION. STEVE LOVED HIS HAND GUNS AND SHOT THEM IN STYLE. CHECK OUT MORE PICS OF STEVE MCQUEEN WITH GUNS AT THE LIFE MAG WEBSITE. 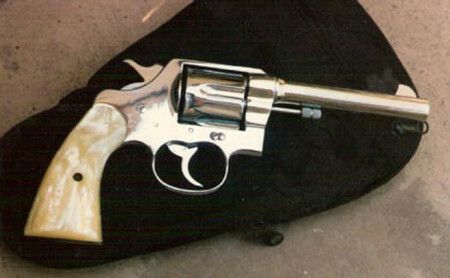 THE COLT 1917 REVOLVER AND THE SMITH & WESSON "VICTORY" WERE COMMONLY ISSUED TO OFFICERS AND PILOTS. MILITARY ISSUE SMITH & WESSON .38 "VICTORY"
Bravo Zulu... well done. What a great post. Smith and Wesson also made the Model 1917, and Indiana Jones carried one in Raiders of the Lost Ark. Uh, I meant to write WWI not WWII, sorry. The 1917 dates to 1917, natch.